The Healthy Ice Cream You Need in Your Life! Brought to you by ENLIGHTENED. Happy National Ice Cream Month! 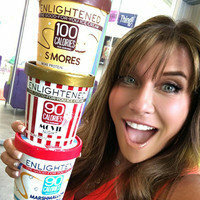 We don’t need an excuse to enjoy ENLIGHTENED ice cream, but since July is a month-long celebration of everyone’s favorite cool & creamy dessert, we’re going ice cream crazy: a virtual party with Lisa, a mega taste test, ice cream giveaways, savings, and more! ⭑ 27 Delicious Flavors: Marshmallow Peanut Butter, Glazed Donut, Brownies & Cookie Dough... All with just 240 - 400 calories a pint! ⭑ Crazy-Good Mix-Ins: Loads of cookie chunks, caramel swirls, chewy brownies… It’s like an ice cream shop right in your freezer! ⭑ The Creamiest Texture: No icy consistency here... Just pure creamy yumminess with the perfect amount of sweetness. 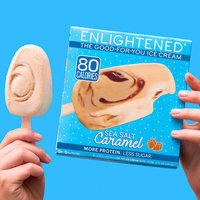 ⭑ Now in MORE Stores: Click to find ENLIGHTENED in the freezer aisle of your local supermarket. Enjoy your favorite flavors on a single-serving stick! Have a lick… er… look... at some of the options! 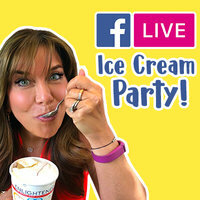 It’s a Virtual Ice Cream Party on the Hungry Girl Facebook Page! ⭑ See All 38 Varieties & Vote for Your Favorites! Which pints and bars should Lisa & the team sample? Sound off in the comments, and see inside the pints! ⭑ Lisa’s Top 5 Flavors Revealed! Lisa is known for her killer taste buds, and she’s playing favorites... Find out which flavors are always in HER freezer. ⭑ Chew or False? Fun Ice Cream Trivia! Ice cream history, shockers, wacky facts, and more... Join the fun! ⭑ GIVEAWAY: Ice Cream Pints, Hats & Coupons! Just show up and participate by chatting away in the comments. One grand prize winner will get FIVE PINTS delivered straight to their door... Perfect for an ice cream party! 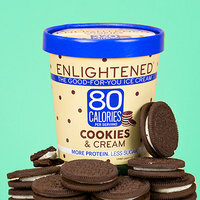 Additional winners will receive full-value ENLIGHTENED coupons and cute ice cream hats. BE THERE TOMORROW AT 3:30pm PT/6:30pm ET... DON’T MISS IT! July is National Ice Cream Month... and if you don’t know how to celebrate by now, we don’t know what to tell you!